1. send water first, check the water is smooth, water pressure р> 0.lMPa, or not allowed to open the furnace. 2. Turn on the mains and close the power supply. 3. Open the mechanical pump, respectively, open No. 1, No. 2 gate. 4. Close the total power of the vacuum gauge, turn on the thermocouple power, adjust the heating current (current adjusted to 128A) to measure the vacuum. When the current is 10OmA, the degree of vacuum is 10-4Torr (0.0133Pa). 5. After the vacuum is higher than 1.33Pa, open the No. 3 vacuum valve, so that the vacuum inside the diffuser also reached 1.33Pa or more. 6. Diffusion pump heating, about 40min later, the pump oil heating evaporation, then closed the No. 2 vacuum valve, and then open the high vacuum valve. 7. Vacuum higher than 0.133Pa after the closure of “thermocouple power”, open the “ionization meter power”, with the ionization meter to measure the degree of vacuum. 9. Turn the circuit power “Manual” knob to the minimum, the switch to the “automatic” position, the “PID” regulator “manual” to the minimum, the switch hit the “manual” position, and connected to “PID “power supply. 10. Electric furnace power supply, adjust the “PID” of the “manual”, so that the three-phase ammeter output indicates a basic balance in the 30 ~ 70A. 11. When the furnace temperature is close to the reference value, set the “PID” furnace temperature control from “manual” to “automatic” for automatic control. 12. After the insulation time to meet the requirements, such as the process requirements with the furnace cooling, can be closed electric furnace power supply. Such as the process requirements to control the cooling, that is, “PID” from the “automatic” hit “manual”, by “manual” to adjust the cooling. 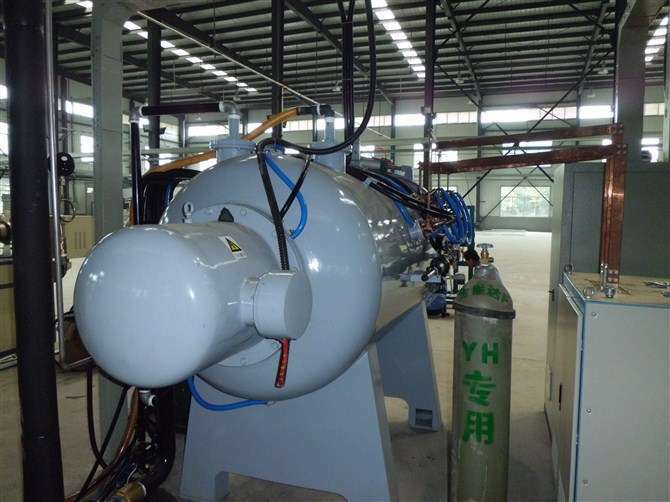 13.350 ℃ above are not allowed to close the water and vacuum system, closed diffusion pump, you must first close the high vacuum valve, and then close the No. 3 vacuum valve, open the No. 2 vacuum valve. 14. When closing the mechanical pump, first close the No. 2 vacuum valve, and then closed the power supply. 15. When the furnace temperature is higher than 150 ℃, are not allowed to deflate and open the lid. 16. Work process must strictly abide by the above-mentioned safety technology manipulation procedures, are not allowed to leave the post, often pay attention to check the water, equipment, vacuum, motor, transformer, fan, meter and other operations are normal, abnormal, timely report processing.